After a short introduction on the basics of reference system theory and its application for the description of earth rotation, the problem of establishing a reference system for the discrete stations of a geodetic network is studied, from both a theoretical and a practical – implementation point of view. First the case of rigid networks is examined, which covers also the case of deformable networks with data collected within a time span, small enough for the network shape to remain practically unaltered. The problem of how to analyze observations, which are invariant under particular changes of the reference system, is examined within the framework of least squares estimation theory, with a rank deficiency in the design matrix. The complete theory is presented, including all necessary proofs. Not only of the usual statistical results for the rank deficient linear Gauss-Markov model, but also those of the rich geodetic theory are presented, based on the fact that the physical cause of the rank deficiency is known to be the lack of definition of the reference system. The additional geodetic results are based on the fact that one can easily construct a matrix with columns that are a basis of the null space of the design matrix. Insights are presented into the geometric characteristics of the problem and its relation to the theory of generalized inverses. Passing into deformable networks, a deterministic mathematical model is presented, based of the concept of geodesic lines which are the shortest between linear shape manifolds, associated with the network shape at each instant. Reference system optimality for a discrete network is related to the relevant ideas of Tisserand, developed for the continuum of the earth masses. The practical problem of choosing a reference system for a coordinate time series is examined, for the case where a linear-in-time model is adopted for the temporal variation of coordinates. The choice of reference system is related to the choice of minimal constraints for obtaining one out of the infinitely many least squares solutions, corresponding to descriptions in different reference systems of the same sequence of network shapes. The a-posteriori change of the reference system is examined, where one moves from one least squares solution to another one, satisfying particular minimal constraints. Kinematic minimal constraints are also introduced, leading to coordinates that demonstrate the minimum coordinate variation and are thus connected to the ideas of Tisserand for reference system optimality. It is also shown how to convert a reference system of a geodetic network to one for the whole continuous earth, or at least the lithosphere, utilizing additional geophysical information. The last item is the combination of data from four space techniques (VLBI, SLR, GPS, DORIS) in order to establish a global reference system realized though a number of parameters that constitute the International Terrestrial Reference Frame. After a theoretical exposition of the basics of data combination, the various methods of spatial data combination are presented, for both coordinate and Earth Orientation Parameter time series, while alternatives are presented for the choice of the origin (geocenter) and the network scale from the scale of VLBI and SLR. Finally, existing and new methodologies are presented for building post linear models, describing the temporal variation of station coordinates. 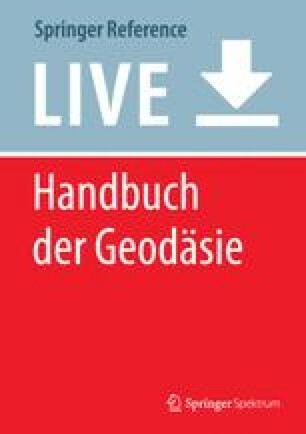 This chapter is part of the series Handbuch der Geodäsie, volume “Mathematical Geodesy/ Mathematische Geodäsie”, edited by Willi Freeden, Kaiserslautern.